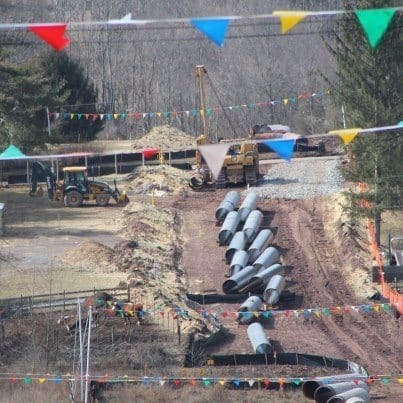 Transco pipeline construction in Hunterdon County. The Federal Energy Regulatory Commission issued its order approving the Transcontinental Gas Pipeline Company’s Leidy Southeast Expansion Project today. The order states that the project will not result in any significant impacts. The order will allow pipeline construction to move forward, as well as allowing for pressure increases at a Transco compressor station in Mercer County. The approval comes amidst a proliferation of new fossil fuel infrastructure in New Jersey to support fracking operations in Pennsylvania. The pipeline will be expanded in Princeton and Montgomery as part of the project. The New Jersey Sierra Club accused the federal government of rubberstamping another pipeline. The Sierra Club believes the environmental review for the project violates federal law by looking at the project’s many loops separately, and by not doing a thorough enough review on the cumulative impacts of the project. Environmentalists say the report ignores the additional fracking the pipeline will encourage in the areas the projects connects to by expanding capacity as well as the cumulative regional impacts resulting from other projects such Transco’s recently completed Northeast Supply Link project and the newly proposed Diamond East project. Earlier this year, in Delaware Riverkeeper vs. FERC, the U.S. Court of Appeals for the District of Columbia determined ignoring the impacts of other projects in the region, as done in this environmental assessment, violates the National Environmental Policy Act. Impacts from other projects Transco has recently completed in the region and those being constructed and proposed by Transco and other companies should have been evaluated, according to the court. Additionally the environmental assessment separated the review of pipeline projects into individual loops. By this method, only the localized impacts of each loop, not their combined, magnified impact is assessed. The Transco Leidy Southeast project will have impacts on sensitive areas across Hunterdon, Somerset, and Mercer Counties. The route crosses the Princeton Ridge, Sourland Mountains, and a number of preserved lands. The pipeline will have significant impacts on waterways, critical habitat, and forested areas, according to environmentalists. Transco filed their application with FERC at the end of September 2013. The Leidy Southeast Expansion project includes the installation of more than 12 miles of 42-inch pipeline in New Jersey. The Skillman Loop will run 6.36 miles through Princeton and Montgomery Townships. The Pleasant Run Loop will run 6.85 miles in Branchburg, Readington, and Clinton Townships. The Pennsylvania portions of the project are in Luzerne and Monroe counties. Washington Gas Light Company for 165,000 Dth per day. Since 2006, Transco’s pipelines have been involved in at least 50 gas transmission incidents. Last year an incident occurred at their pipeline in Branchburg, injuring 13 workers. This year Transco experienced two major incidents at pipeline facilities. In West Virginia, a pipeline exploded burning down 2 acres of forest. In Wyoming a pipeline caught on fire resulting in the evacuation of 95 residents. Actually we replaced the photo because the main issue is approval of the pipeline. We meant to have the story render a photo of pipeline work, not a diagram of fracking. Thank you. People, please, you are disrupting the narrative!!! Fracking in PA was over a mile below the water table. That image is deeply misleading and you should replace it. Fracking occurs far, far below the water table.